Why would we evolve to poop in the same place as our friends? Humans aren't the only creatures who share communal toilets — many mammals do this. In fact, new research shows this behavior was an ancient evolutionary development. Scientists have discovered a large, rhino-like reptile defecated in "communal latrines" some 240 million years ago. Image above: Artistic recreation of the ancient reptiles, dicynodonts, using their communal latrine. Courtesy of Emilio López Rolandi. Communal latrines, or defecation spots, are exactly what they sound like: Relatively small areas where multiple individuals relieve themselves, sometimes at the same time. Humans and housecats obviously defecate in communal latrines, but studies show that a number of other mammals do, too, including meerkats, lemurs, spider monkeys, and tiger quolls (a kind of marsupial). The behavior is particularly common among large herbivores, such as elephants, horses and rhinoceros. Without this behavior, people would likely have a major sanitation issue, especially considering that there are now 7 billion of us on this planet. But why would animals bother to confine their excrements to a small area? What does a world of 7 billion people look like? Turns out, communal latrines have important biological functions. "In some cases, the communal latrines define an area or territory," says Martın Hechenleitner, a paleontologist with CRILAR-CONICET in Anillaco, Argentina. "In other cases, they prevent the re-infestation of parasites." Despite their usefulness, communal latrines have always appeared to be a mammalian phenomenon. What's more, these defecation spots are quite rare in the fossil record. "It's not easy to find these kinds of fossils," Hechenleitner tells io9. But recently, while studying the fossils in the outcrops of the Chañares Formation in the La Rioja Province in northwestern Argentina, that's exactly what Hechenleitner and his colleagues found. The eight communal latrines the researchers discovered were each 400 to 900 square meters and 1.5 kilometers apart (they expect to find more latrines in the future, as they've only surveyed 20 percent of the Triassic Chañares Formation outcrops). These fields were loaded with fossilized poo called coprolites — within the latrines, there were, on average, 67 coprolites per square meter, but in some areas the poo density reached 94 coprolites per square meter. Given the amount of coprolites and their size variation, the researchers believe the latrines were really communal, and used by many animals of different ages. For the most part, coprolites are easy to pick apart from other fossils. "They have a particular structure and are really round, and usually have some cracks on the surface," Hechenleitner said. The coprolites the team found were mostly ovoid or spheroidal in shape, but some were shaped like segmented sausages and others looked like sausage coils. The researchers cut open some of their samples to examine them under microscopes. "In the sections we found many tiny fragments of vegetation," Hechenleitner said, adding that this further proved they were dealing with coprolites. Within the coprolites, the team found woody fragments, leaf fragments, fossil mosses and fern-like spores. Importantly, CT scans of the fossils showed no evidence of bone fragments, suggesting that the animals the poo belonged to were not carnivores. But the Chañares Formation, which dates back to the Middle to Late Triassic, holds a wealth of fossils of various ancient reptilian species, so the researchers set out to determine who really used the communal latrines. Some of the coprolites were extremely large — up to 35 centimeters in diameter — suggesting that they belonged to big herbivores. Using this information, the team was able to rule out a number of different animals, such as Massetognathus, whose maximum skull length is only 20.4 cm. Additionally, the high density of the coprolites and the size of the communal latrines suggest that the coprolite producers were very abundant. With these lines of evidence, the team figured that the latrines belonged to a species of dicynodont, which is a group of four-legged, large-bodied, mammal-like reptiles. Though they're not sure yet, the researchers believe that Dinodontosaurus — the most abundant dicynodont in their study area in the Chañares Formation — are responsible for these fields of poo. These animals were among the largest herbivores of the Triassic and could weigh up to 3,000 kg. Though dicynodonts have specialized mouths that would appear to allow for specific movements necessary to chew vegetation, some researchers have previously suggested that the animals may have been omnivores or even carnivores. But if dicynodonts really did produce the coprolites in the latrines, it would mean that dicynodonts were herbivores after all. The new discovery also indicates that the seemingly mammal-only behavior of defecating in communal latrines developed before mammals first evolved. This new find actually predates the previous fossil record of communal latrines by 220 million years. We may owe our sanitary practices to our reptile ancestors. 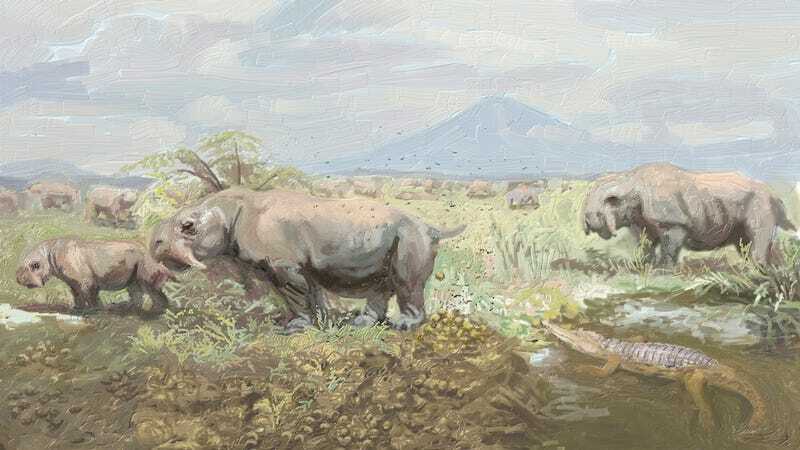 The researchers now plan to study the fossils further and potentially discover why the dicynodonts had communal latrines. "It's a behavior tied to a particular function, and we need to now explain what that function is," Hechenleitner said. By analyzing the contents of the coprolites, they also hope to learn more about the animal's environment. "These feces are very important to understanding which plants covered the area 240 million years ago." Check out the study in Scientific Reports. Inset image via Lucas E. Fiorelli/CRILAR - CONICET.